Note that the Monophonic effects should be used only with monophonic sources such as solo voice, saxophone, etc., because they rely on extracting the pitch. Spectral Machine is no longer available. "Dude your plugin is f****** outrageous. I am freaking out. It's amazing man I love it"
hours of fun to be had"
"Once again you and your team have created magic. This is going to be one of those plugins that I am going to use every day like SFX Machine. It's totally ground-breaking and brilliant!" "Spectral Machine gives you the total creative freedom to tweak sounds and experiment with sounds with its unique frequency-domain effects. This would be my first choice for processing regular guitar sounds into otherworldly, ambient guitars.... Spectral Machine is also brilliant for just about any audio sources, turning boring sounds into 'wow' sounds.... The fun factor of Spectral Machine is unbelievable." - Wusik Sound Magazine, Dec. 2011. "There's a lot more to life than parametric EQ, dynamics, and reverb; frequency-domain effects can add entirely different sounds to a variety of audio sources." - Electronic Musician magazine, Nov. 2011. WHAT CAN YOU DO WITH SPECTRAL MACHINE? Apply separate delays to different spectral bands, with individual control over the amount of feedback in each band! Click the "Fire" button to freeze the sound, which then decays at different rates for high and low frequencies. Click the "Reset" button to unfreeze. Similar to Spectral Freeze, but it automatically retriggers at a specified interval. A tremolo effect with individual control over the modulation rate and depth in three frequency bands. Precise control over the gain in three user-selected frequency bands. Lets you boost or attenuate an arbitrarily narrow frequency band around a specified frequency. Interesting peak/notch effect with an oscillating center frequency. Frequency-domain transposition with timbre preservation. Multiple transposition with timbre preservation. This can also be useful for thickening vocals or monophonic instrumental tracks without typical time-domain artifacts. Nudge each note to the nearest semitone, for pitch correction or to create an interesting vocal effect. Isolates the tonal portion from the rest of the sound. Gives you independent control over the sinusoidal and noise/transient portions of the sound. Lets you change the shape of vocal formants (spectral envelope) without affecting the pitch. Frequency-modulates only the sinusoidal component. Changes the pitch to a fixed frequency for a robotic effect. Spectral Machine is 32-bit only; however, the Audio Unit version will work with 64-bit host programs if you own the 32 Lives adapter, http://www.audioeffects.com/32-lives.html . 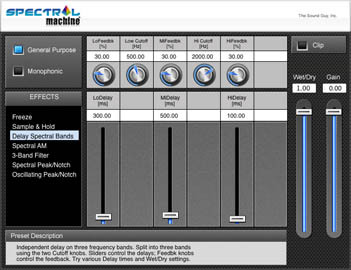 The Spectral Machine Pro User Guide is online. Read the friendly manual! Spectral Machine © 2012 The Sound Guy, Inc.